Film Plot: The ancient vampire Count Dracula arrives in England and begins to prey upon the virtuous young Mina. Grade: C5	Very Good to Fine. Folded, double-sided. Used UK trade advertisement with moderate handling/surface/fold wear. Large diagonal corner crease in upper right, some mis-folds, paper is lightly soiled, small unobtrusive writing in the lower right, and slight touch up to areas of ink loss with conservation safe, acid-free, watercolor pencils. Dracula and Frankenstein were the first big Universal Horror films and they continue to be some of the most popular horror films of all time! It is well known amongst horror fans that Universal re-released the two films in 1938 as a double-bill in the United States. 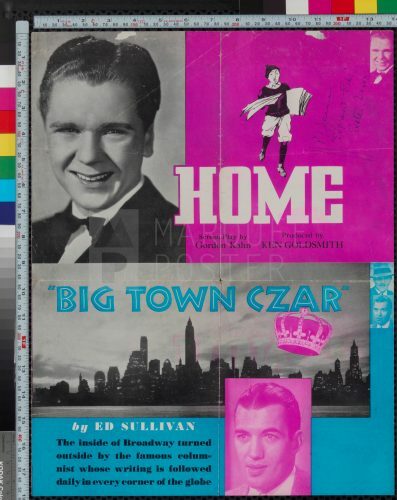 However, this double bill crown poster proves that the pairing was also shown in the UK in the months leading up to Britain’s involvement in WWII. Due to the relentless German bombing campaigns, paper drives and post-war fire codes, movie materials from before the mid-1950s are extremely scarce. 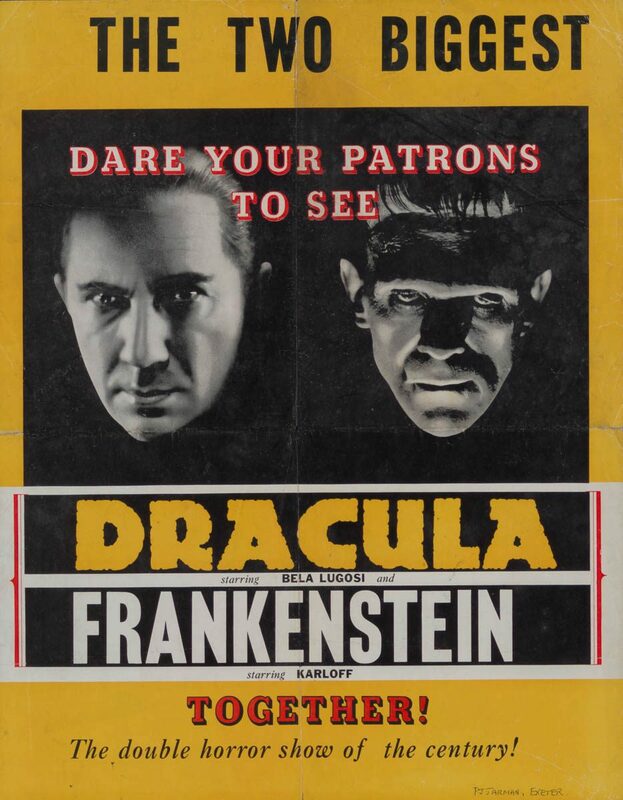 To my knowledge, there are no publicly known British posters that exist for either Frankenstein or Dracula from before WWII putting this crown sized poster into a class by itself! 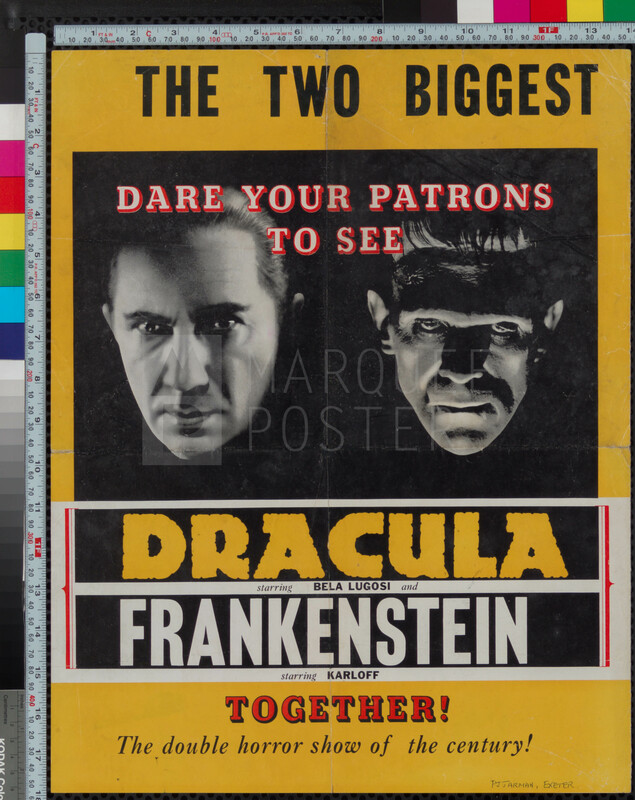 In addition to being extremely rare, it also features two wonderful portraits of Bela Lugosi as Count Dracula and Boris Karloff as Frankenstein’s monster.